The menus and there associated options will change depending on the Mode selected in Options in the lower right corner of the user interface (UI). The default setting in Options is Auto for most input documents or Delimited for certain types of delimited input. Note: Undo and Redo are not available in all areas of TextConverter. Undo and Redo are fully enabled in the script editing pane. Buttons: New Project ( ), Open Project, Save Project,Run Conversion( ), Run Target Reports, Run Free Form Reporting, and the purple book is Help, it leads to this web site. New - Closes the existing conversion project and creates a clean workspace to start a new project. If the existing project is not saved, you will be prompted to save the project (or abandon the changes). Load Input File - Opens a new file for extraction and transformation. Load input file will allow you to open popular document formats including PDF, DOC, RTF, XLS, HTML, CSV and free formatted text files. When you choose Load Input File, The Open/Save dialog will open. Open Project... - Opens an existing project file. Project files store the details of each conversion project. See Open/Save dialog to learn how to open a file. Save Project - Saves the current project to a file. If you save the project for the first time, Open/Save dialog will be shown, otherwise, if the project was previously saved, the project will be saved to an existing location. Save As... - Use the "Save As" menu item from the "File" menu to save the project to a new location. View Target Log - Certain editions of the software allow you to view the target event log. The target event log can also be opened as a data source and viewed from the data browser. Run Conversion - Runs the conversion process. You can view the conversion results in a form of a database table after the process has finished. Click on the Browse button ( ) button on the output pane to see the results. If no output data source is selected through the output pane, you may see an error message, depending on your configuration. Important: Connect an output database or file before you run your conversion. 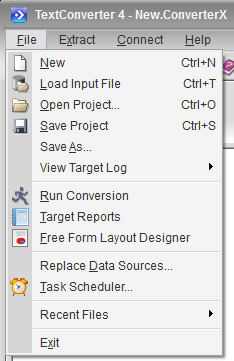 Target Reports - Target Reports and Free Form Layout Designer are integrated into TextConverter. After you have completed your data extraction and conversion, you can click this to open a Target Reports window to easily create a report or free form layout for that conversion. Replace Date Sources - Opens the replace data sources dialog where you can change the path(s) to the input, output, and/or project file(s). Task Scheduler... - Use the Task Scheduler to run any TextConverter or other TARGET project through the Windows scheduler. While the task scheduler is a good simple interface for simple tasks, you can gain ultimate flexibility by creating a VBScript or other automation program that uses the API included with TextConverter. 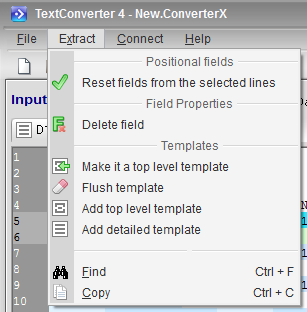 All packages except TextConverter Standard Edition include a full API for all functions. Recent Files - Provides a convenient list of recently opened files. Exit - Exits the program. If the existing project is not saved, you will be prompted to save the project (or abandon the changes). The extract menu appears in Auto mode after you have loaded an input file. This menu supports the creation and editing of Templates and is similar to the right click/fly menu. Create a new Template by selecting one or more lines that represent data for a single record, then choose Setup fields from selected lines. If you have already created a template, the menu option will read Reset fields from selected lines and offer an option to click on a value for a field and Delete field. If you created a detail template and later decide that it should be a top level template, select Make it a top level template. Note: your detailed template creates records, top level templates add data (fields) to records. You must have a detailed template template to extract data in Auto mode. You can get rid of a template that you have created by choosing flush template. Add new templates with add top level template and add detailed template. Find and Copy are used for values in the data that you are extracting and are great for finding your way around a complex input document. You can also use Copy to get values for a Mask. Connect input-output - Connects the input and output field(s). When connected, the default conversion procedure will transfer the input values from the input record to the output record. Disconnect input-output - Disconnects input and output field(s). When disconnected you can still pass data from the input to the output using script conversion. Reset output dictionary - Resets the output dictionary from the input dictionary. The command discards all the changes made to the output dictionary. Create script conversion - Creates a script customization for the selected output field(s). Go to script conversion - Locates the script customization for the selected output field. 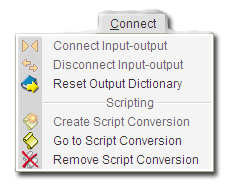 Remove script conversion - Removes the script customization for the selected output field(s). The help menu provides access to the off-line help files through Contents, Search, and Index. 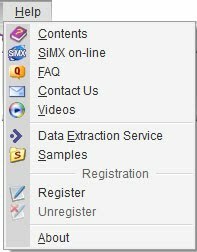 It also allows you to access SiMX's Data Extraction Service where you can submit an input file and receive back a fully configured project and access to on-line help. The on-line help pages are similar to the off-line help pages but contain the most up to date information. Samples displays all of the sample projects installed with your software. From the help menu you can also Register and Unregister your software, and find your version with About Target. 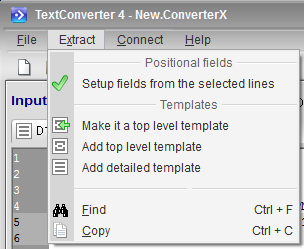 (Note: TextConverter and TARGET Reports always have the same most current version number because they are both parts of the SiMX's TARGET platform.) To find the current distribution version, visit www.simx.com and click "Support".